Club de Golf Alcanada is “just a few weeks away” from being at 100 per cent, following its ambitious winter revamp. An extensive €700,000 renovation project took place over the winter to replace all 18 greens, upgrade the irrigation, renew all sand in the bunkers and various other improvements. The course reopened on March 1 and the new greens have already earned rave reviews, especially from visiting club professionals from other Mallorcan courses at a recent event. But director of golf, Kristoff Both, believes there is further improvement to be seen at the course – not because of the quality of the new greens, but because of the associated works which will take just a little longer to settle. Both explained: “I guess some people always expect the course to be absolutely perfect and it’s probably at about 90 per cent at the moment. It was impossible to have everything at 100 per cent on the first day and most people understand it takes a couple of weeks more until the other re-turfed areas perfect. Both insists the vast majority of the early feedback has been overwhelmingly positive about the Alcanada upgrade – especially from those who might occasionally be quick to point out any failings. 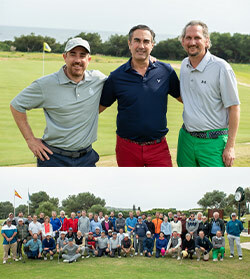 He said: “We hosted a tournament for the staff members of the other golf courses in Mallorca. It was a good test for us to have these people who would never be too shy in being critical about us! We had some of the local club pros, restaurant workers, maintenance workers and directors of golf. It was great fun. “These people all know golf and they all know how hard it is to maintain a golf course. They were all saying ‘Wow. You guys did a great job this winter’. It was very positive for us and the professionals who played thought the greens were amazing. “We have to remember that we are still in pre-season and the course is a living animal. It is already really good but will only get better and better in the next few weeks and months as we add more finishing touches. “The greens are playing very, very well and they look awesome. The last hole was only turfed five weeks ago and they are just a little slower than we are used to – they are around 9.5 on the Stimpmeter when we are usually at around 10.5-11. But they will get quicker in a matter of weeks.